The 100-foot-tall tower would stand 850 feet inland from the edge of the marsh, behind the town's sewage treatment facility. SCARBOROUGH — Ann Hancock stands on her front porch on Old Neck Road, overlooking a cove where the Libby River snakes through the vast and grassy Scarborough Marsh, and she imagines the worst. 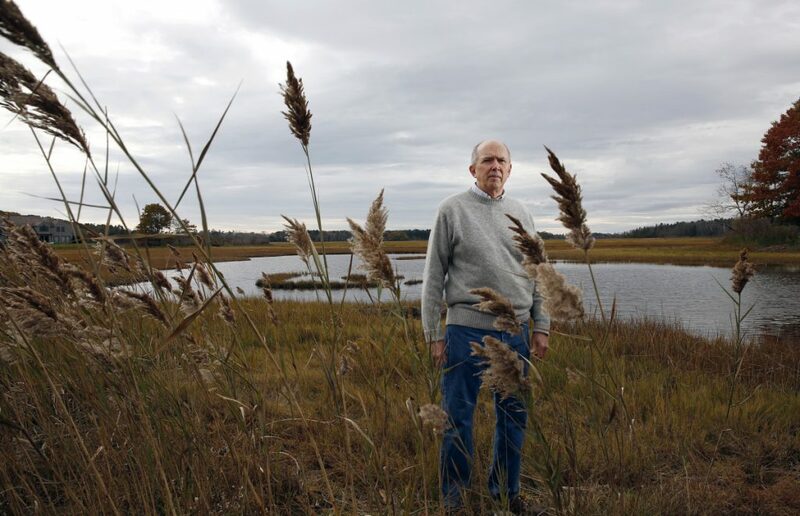 Across the marsh – about a mile away as the gull flies – in a patch of woods behind the town’s sewage treatment facility, Verizon wants to install a 100-foot-tall cell tower that would rise 20 to 30 feet above the tree line. The tower would stand about 850 feet inland from the edge of the marsh, behind several large industrial structures that make up the sewage treatment plant off Black Point Road. Still, Hancock and her husband are among those who would have a prime view of the tower’s upper reaches. Hancock is among a group of residents, backed by the Prouts Neck Association, who are fighting Verizon’s proposal before the Planning Board. They’ve hired experts to take on the multinational telecommunications company, including one who helped the town develop its cell tower ordinance four years ago. Opponents of the tower say – and some town officials agree – that the ordinance is flawed because it allows Verizon to put the tower where it won’t improve local cellphone coverage and where it will spoil views of one of Maine’s most prized coastal resources. Verizon’s lawyer, Scott Anderson of Verrill Dana in Portland, defends the cell company and its tower proposal. He disputes opponents’ charges that it will improve overall carrying capacity for Verizon’s system but not local coverage, especially near the tower itself. 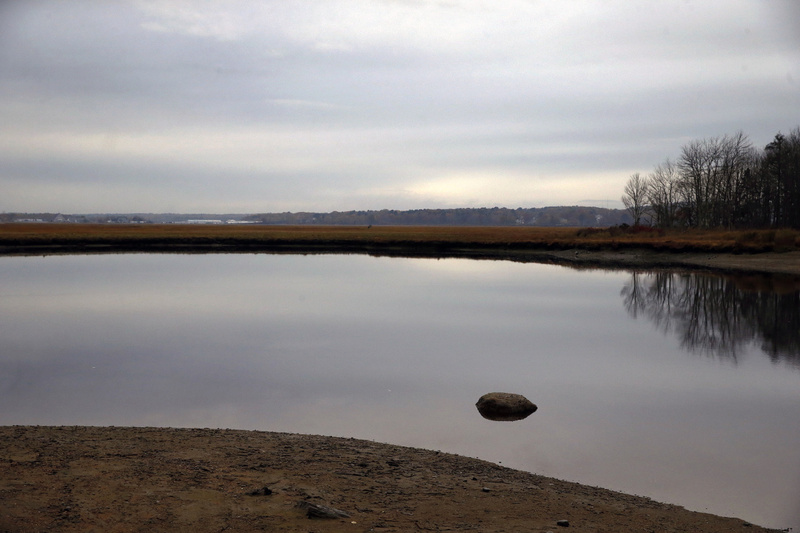 A tributary of the Nonesuch River, within Scarborough Marsh, fills with the tide last week. A proposal to erect a cell tower near the Scarborough Marsh has drawn opposition due to its potential visual impact. Fed by several rivers and creeks, Scarborough Marsh stretches over 3,000 acres along the edge of Saco Bay, from Old Orchard Beach to Cape Elizabeth. It’s home to many rare birds and other wildlife, and it affords expansive views of spectacular sunrises and sunsets that enthrall kayakers, photographers and other outdoor enthusiasts. 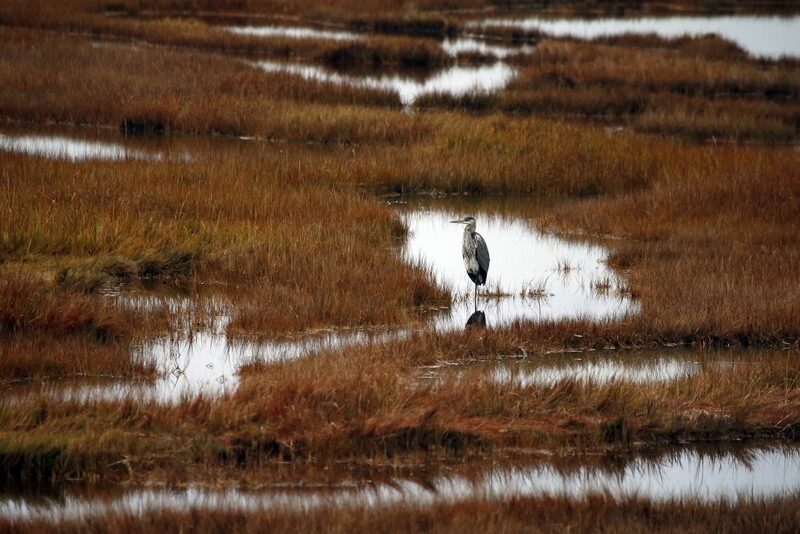 A Great Blue Heron wades in Scarborough Marsh. A proposal to erect a cell tower near the Scarborough Marsh shoreline has drawn opposition due to its potential visual impact. So, while cellphone companies often face opposition when siting towers, Verizon officials knew they were in for a pitched battle over this one, Anderson said. He disputes opponents’ claims that he has threatened to file a lawsuit if the Planning Board rejects the tower proposal, but he says the company is following rules and guidance for cell towers that are laid out in Scarborough’s zoning ordinance. Among the discounted sites is the Black Point Fire Station property, which Ann Hancock prefers. Anderson said it’s too small and near too many homes to host a new tower or an expansion of the flagpole communications antenna that’s already there. Moving through a complicated, three-step review process, Verizon has so far satisfied the board that there is no location more suitable than the Sanitary District’s property, said Town Planner Jay Chace. However, the board has asked Verizon to consider other sites on district land that might reduce the tower’s visual impact. Verizon is expected to return to the board in November or December. 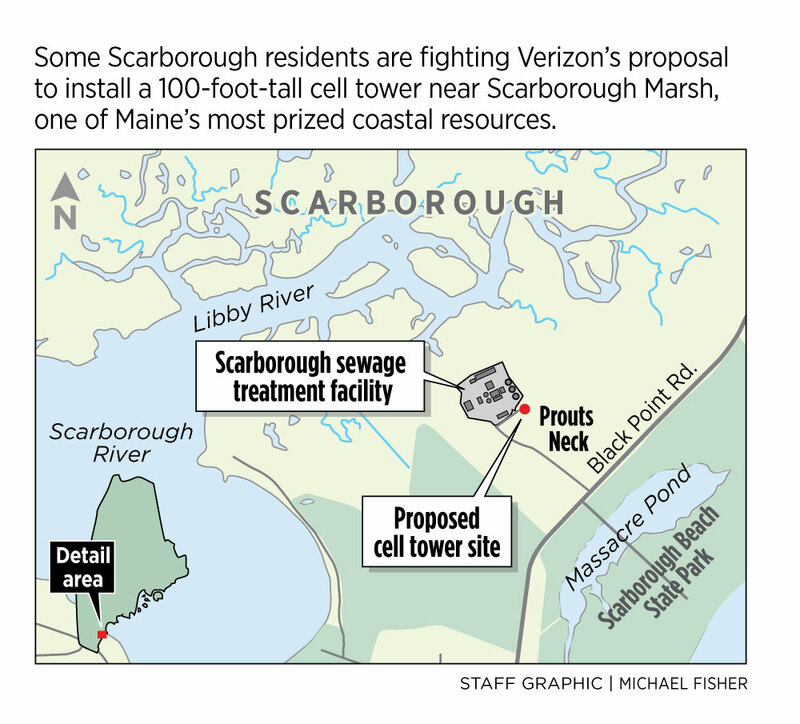 Verizon has been seeking board approval since January – shortly after it secured a lease from the Sanitary District for a 75-by-75-foot parcel behind the sewage treatment facility off Black Point Road for $2,500 per month or $30,000 annually. Verizon doesn’t pay rent until the project is approved. The Sanitary District trustees didn’t consider how the tower might affect views of the marsh or satisfy other zoning ordinances when it approved the lease 7-0. Anderson said he’s not related to Scott Anderson, Verizon’s lawyer. He also said the trustees make a point to avoid Planning Board territory when reviewing projects. But Anderson questions whether the tower would have a significant impact on views. He lives near the marsh and has traveled its rivers and creeks. Verizon is willing to install either a standard “monopole” tower with antennas attached to the exterior; or a “monopine” tower that disguises exterior antennas in evergreen branches; or a “brown stick” tower that contains antennas within its structure, Scott Anderson said. Anderson disputed opponents’ concern that Verizon might one day return to the Planning Board with a request to increase the tower’s height to 150 feet. Federal law would limit the extension to 120 feet, he said. He also noted AT&T and Sprint are interested in locating antennas on the tower below Verizon’s antennas. Opponents of the tower have asked the Town Council to pass a moratorium on additional cell tower proposals until it can address gaps in the zoning ordinance. In particular, the ordinance doesn’t require companies to demonstrate that a tower will improve local cell coverage. Town Manager Tom Hall said the council hasn’t considered the moratorium request yet, but amendments to the cell tower ordinance could be proposed in the near future. “It’s fair criticism that the ordinance as written is not sufficient to protect abutters’ interests,” Hall said.